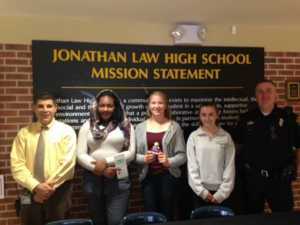 A competition among ninth-graders at Jonathan Law High School resulted in billboard designs supporting the mission of the Milford Prevention Council. Approximately seventy students participated through their health classes, hoping to be one of the winners whose art would be displayed on a Outfront Media during the summer. 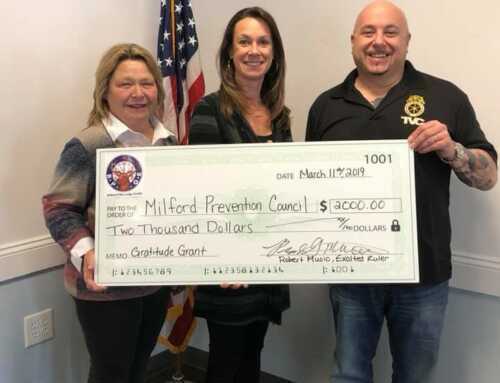 The purpose was to bring awareness to the issue of underage drinking, a primary mission of the Milford Prevention Council. Students were provided with statistics about underage drinking, making students aware that many of their peers refrain from drinking until they are 21. Submissions were evaluated by three focus groups at the Woodruff YMCA and members of a Milford Prevention Council committee. The four winners whose billboard designs will be displayed this summer are: S. Winters, Cassandra, Juan Pablo (not pictured) and Cece. Also included in the picture is Jonathan Law High School Principal Fran Thompson and School Resource Officer, James Kiely. The high school’s health teachers, members of the Milford Prevention Council and Principal Fran Thompson all congratulate and thank the students on a job well done!